Here comes our UKM's election day, the last chance for me to vote in my uni life, but this year isn't as jolly as last two years, or people were bored with these kind of thing when we come to 3rd year? Was thinking about how is the election for our state and country look like, should be clamorous. By the way, I'm the electorate already, will have chance to throw my holiness vote in this year. Teehee. Kept plenty of vouchers in my wallet (did I mention before, it is hand-made? Giggle), got some new vouchers last night, given by my roomie. 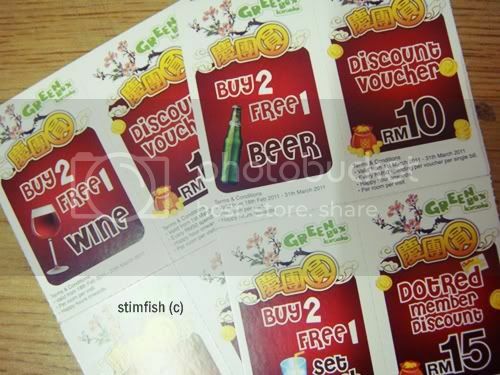 They're GreenBox's vouchers, valid until end of March. Anyone? Will only available after 18th of March, my doomsday.